Born in Nepal in 1925, Indra became a tattoo artist at the age 18, learning the art in India from a friend of his father. He left India in 1950 and travelled to Singapore. 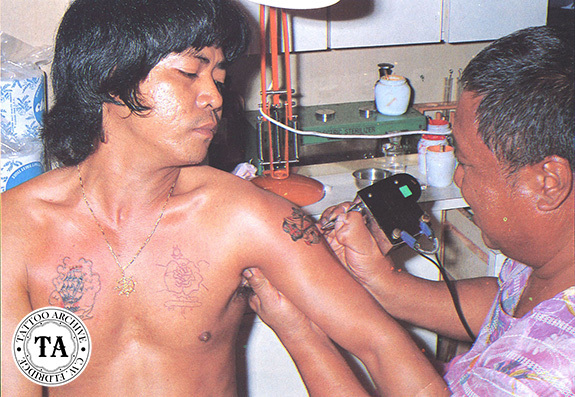 With many years of tattooing experience behind him, it was no wonder that he made a name for himself in Singapore. His shop was located on Bras Basah Road and was well patronized by tourists, sailors and locals who had heard of his skill. Johnny Two Thumbs tattooed with his unusual machines. He worked with very short tubes so the machine body rested on the back of his hand, between his thumb and fore-finger. The inner working of the machine was not much more than a doorbell assembly bolted to a wooden backboard. This was then covered with a tin box, to conceal his machine design. Connector cords or clip cord fastened to terminals on the side. 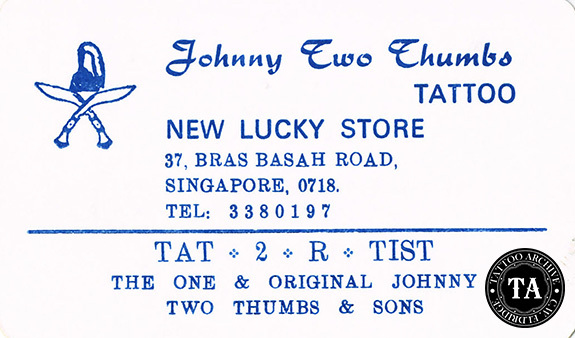 Paul Jeffries visited Johnny at the Bras Basaah Road shop in 1984 and reported that the shop walls were covered with Pinky Yun flash, uncolored, as most of the locals wanted outline tattoos only. Johnny Two-Thumbs died in the late 1980s.